A True Measuring Tool of TRAINER INTENT! Wouldn’t it be great if we could get into a trainer’s mind? I mean, really have a good idea of his/her thought processes when entering a horse into a race. Is the intention simply to get his runner some exercise while prepping for a future race? Or does he feel that his charge has big chance to grab the fat end of the purse. 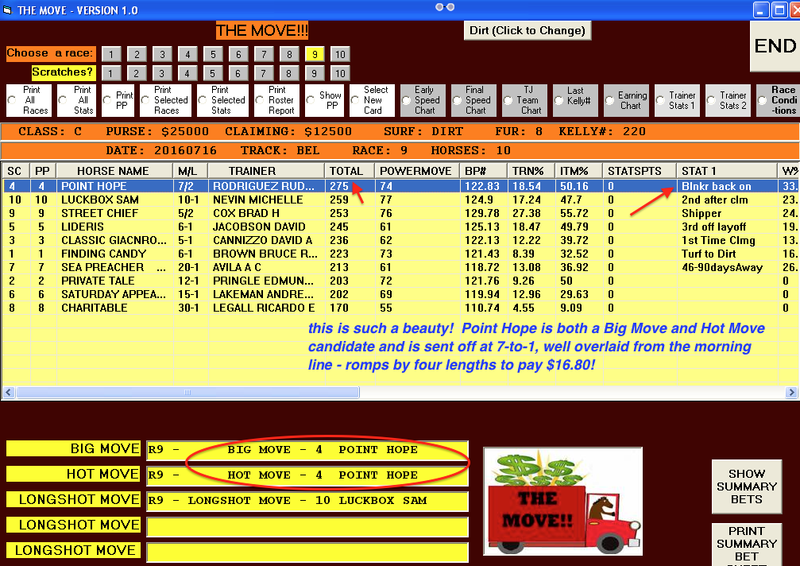 Screenshot of Arlington 4th, 7/14: A Longshot Move by trainer Kordenbrock — Eternal Ruler wins easily at $13.40 — The other Longshot Move horse, Kanagaro, just missed 2nd at 7-to-1. The fact is, that while a competent jockey is very important, the real ‘brains’ behind the animal is the trainer. What separates the good trainers from the bad? Most know how to condition a horse; how to feed and nurse soreness and injuries. So what makes the difference? In one word: Spotting. By ‘spotting’, we mean the ability of the trainer to ‘spot’ his horse in a race he can win or collect purse money. What’s so hard about that, you ask? Well, the simple fact is that most trainers tend to be overambitious with their stock. There is a natural tendency to overestimate the ability-level of a runner. Therefore, you will see animals who are constantly entered in races where they do not belong – the competition is simply too tough for them. And, often, rather than drop them in class, the trainer continues to ‘spot’ the horse too ambitiously. Millions of dollars are wasted daily betting such animals. The real winners in the trainer game are the ‘realists’ – conditioners who can accurately gauge the ability level of the horses they are training. They ‘spot’ their charges in races where they feel they will be competitive. If the horse doesn’t run to expectations, the smart trainer will continue to try to find the proper spot for his charge. >>>Why did the trainer put this horse in this race? What are his/her intentions? When we are able to get the answers to these questions right most of the time, we suddenly promote ourselves into the realm of the professional thinkers — the professional handicappers! And the truly competent, winning horseplayers, who have years of experience at the game, can do exactly that. Think the trainer was surprised her horse won? Doubt it seriously, since The MOVE identified her as a trainer who has cashed in with price horses coming off layoffs of 45 days or more several times. Would the average fan betting Arlington that day know this? Of course not – they wouldn’t have a clue. 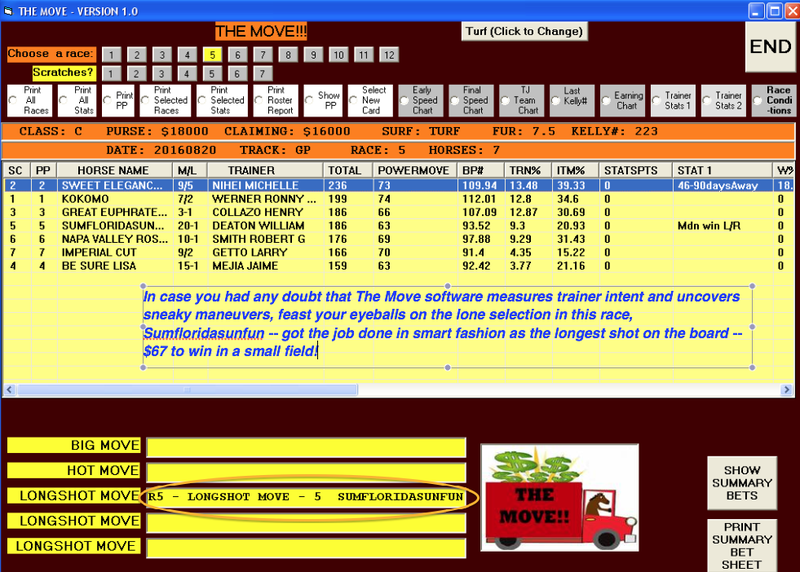 But The MOVE software told us that this trainer was serious on this day – Chances are the stable cashed in handsomely as well. 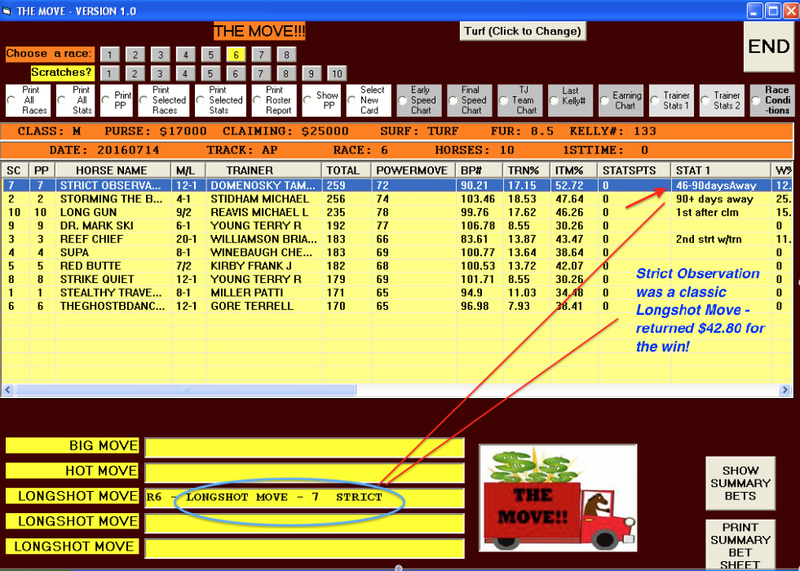 The MOVE analyzes 51 different trainer angles using an internal program called MasterStat Pattern Finder, and spotlights the trainer(s) whose expertise match most closely with today’s conditions, be it surface, distance, surface switch, distance switch, class, class drop, class rise, recent claim, 2nd-time starter, 45+ day layoff, 90+ day layoff, blinkers on/off, etc., etc., etc. The Program will tell you, instantly, which trainers have above-average to excellent success with any of these stats that are relevant to today’s race. When Trainer Rudy Rodriquez puts blinkers back on a horse, he wins one out of three times and finishes in the money over 50% of the time. Oops, looks like the crowd had no idea a money move was being made here. 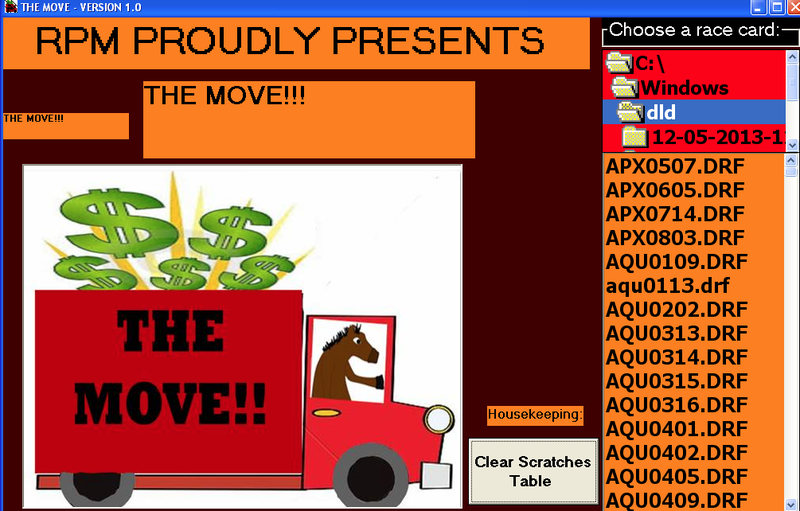 $16 for folks using The MOVE program. 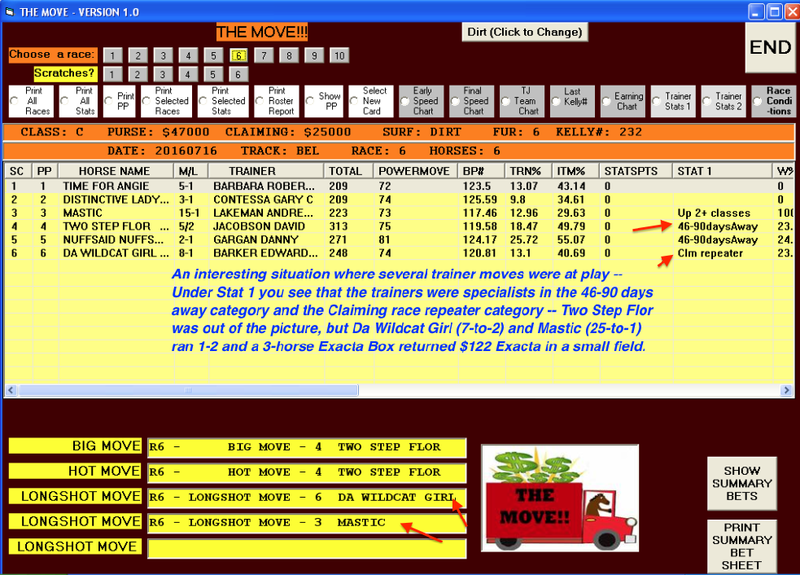 BIG MOVE = The most potent kind of trainer move, based on outstanding stats in one or more category that applies to today’s race and adding in high numbers in Factor Columns POWERMOVE (a rating based on the trainer’s overall ability on two or more factors over the past 24 months), BP# (Bris Prime) & Overall Trainer Win % and ITM %. 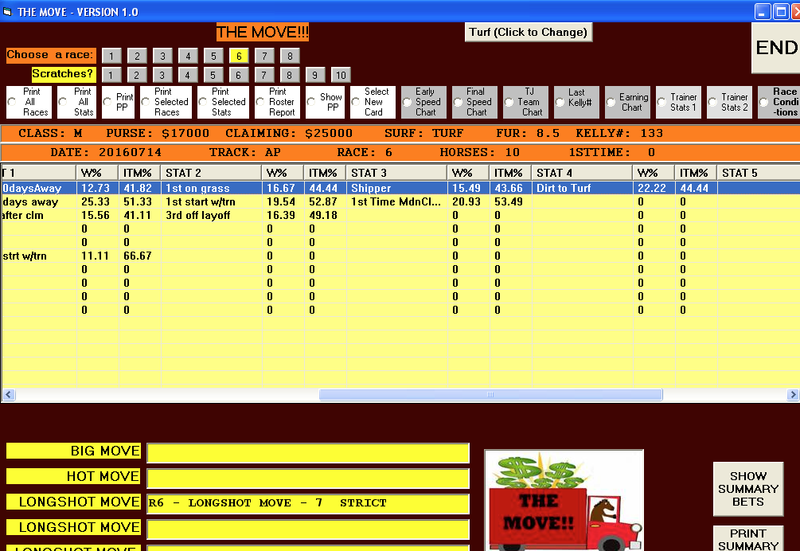 HOT MOVE = A high-percentage Win and, especially, In-The-Money Trainer Move that reflects the trainer’s past ability to turn today’s relevant stats into a 50%+ on the board hit — these horses finish in the Exacta, Trifecta and Superfecta very, very often. 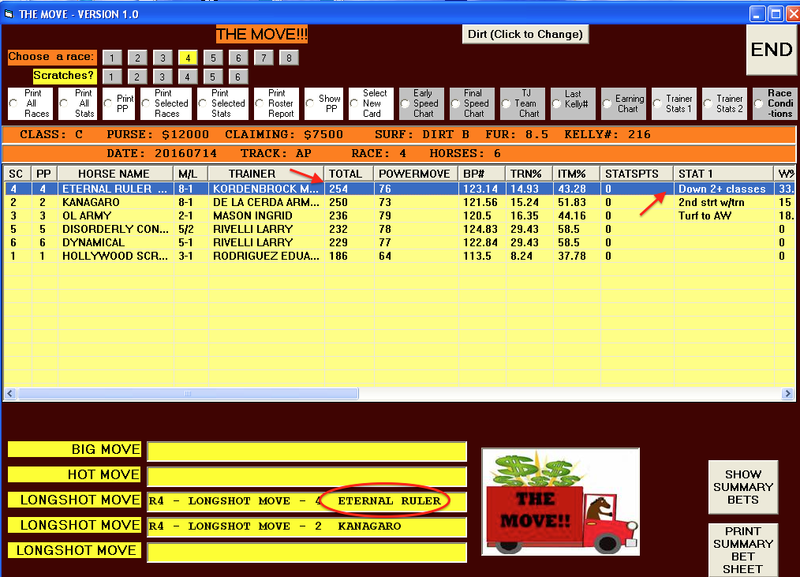 LONGSHOT MOVE = The program, thanks to the MasterStat Pattern-Finder algorithm that works ‘behind the scenes’, recognizes when a trainer is rolling the dice and going for a price. There can be more than one Longshot Move in a given race — if both are at 6/1 or higher on the morning line, both are worth a play. Very fairly priced at just $177 (you can take advantage of of 3-payment/no interest play if you wish). You can download the program right away, or we can send you the disk and manual, or you can do both. Thanks, and please contact us if you have any questions whatsoever!